This month, three additional Wayne County Sheriff’s Office deputies began their new roles as School Resource Officers (SROs), serving at Greenwood Middle/Meadow Lane, Eastern Wayne Middle, and Rosewood Middle. The SROs were provided through a state grant, and were part of a collaborative effort between Wayne County Public Schools (WCPS) and the Wayne County Sheriff’s Office (WCSO) to increase school security efforts. 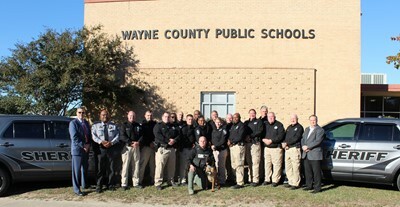 It is worth noting that this school year, the WCSO has added a total of seven additional SROs. Four of the seven added SROs were provided this fall through a special allotment by the Wayne County Board of Commissioners (BOC). They serve at Brogden Middle, Norwayne Middle, Grantham Middle/Elementary, and Mount Olive Middle. New this school year, the WCSO began providing a roving K-9 officer in August, conducting random drug searches of school buildings and parking lots.